You trust your employees, right? They’re smart and work hard, otherwise you wouldn’t have hired them. Maybe you can let yourself slip. Go on sabbatical. 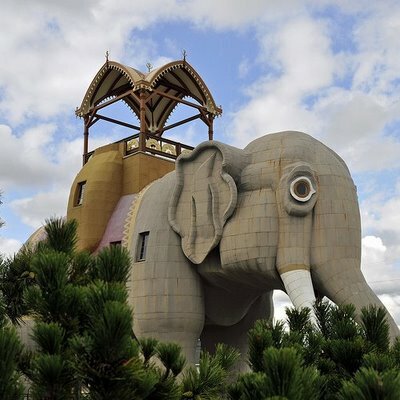 Finally road trip to that house shaped like an elephant. I bet that’s what Alan Mullaly thought. The Ford Company runs like a well-oiled machine! A Toyota, for example. It can take care of itself for a while. But then, as good ol’ Alan is staring out of a window in Dumbo’s ear canal, he gets a text message. It’s just a picture. Not as cool as the elephant shaped like a house. If you need an explanation (though why would you? ), that’s former Italian Prime Minister Silvio Berlusconi in the front seat, giddily flashing a peace sign after kidnapping three prostitutes. Just to remind you, THIS IS AN ADVERTISEMENT FOR THE FORD MOTOR COMPANY. Alan Mullaly is no longer quite so happy to be visiting an elephant in Margate, NJ. In the words of America’s greatest showman: But wait! There’s more! Apparently, advertising firm WPP created these posters to promote the Ford Figo – a car available exclusively in India – and its extravagant trunk space (not as much trunk space as the elephant house, though). The key there? “Individuals acting without proper oversight.” If you’re running a business, you have to be able to accept that people make mistakes. But it’s your job to make sure those mistakes don’t become public and hurt your business. I can guarantee that WPP and Ford are both taking a long, hard look at their internal practices. This might be an opportunity for you to do the same. This is weird, but at least it’s not criminal. Unless those people are also kidnapped. There are lot of ways that you can evaluate your business, depending on your goals. We’ve already talked about some simple things you can do to improve your customer service. Try to keep your technology up to date. Make sure employees are well-trained, and that you have clearly delineated business practices for them to fall back on in unusual situations (like, say, a cartoon ad coming across their desk featuring any number of felonies). Going back to basics may seem… well, basic. But it’s also the best way to avoid a catastrophe on the scale of Alan Mullaly’s ruined vacation.